Xeomin is an incobotulinumtoxinA product is a competitor to the establish Botox Cosmetic and Dysport. Xeomin and Botox are much more related than Dysport. The IAPAM queried its faculty for an overview of the differences between the 3 products. 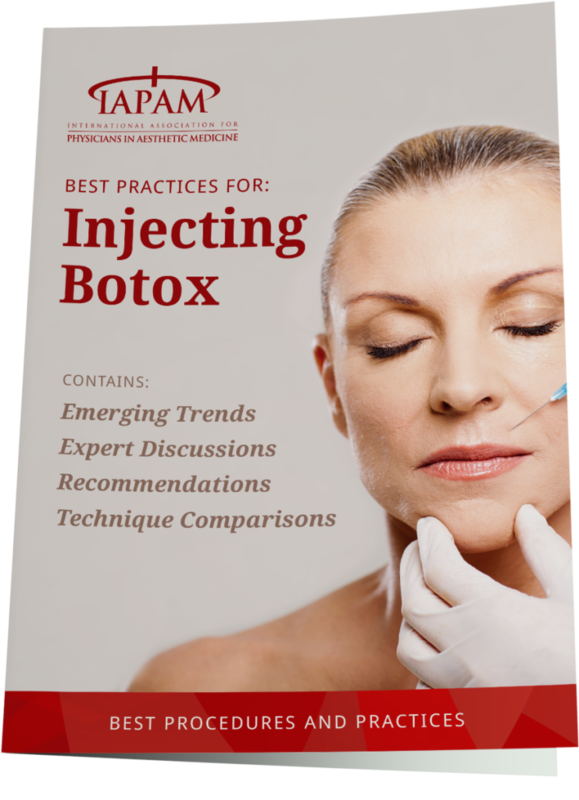 All the experts we queried agreed that the key to using any of these products: Botox vs Dysport vs Xeomin is to first engage in comprehensive injectables training program that includes all three as part of the didactic. The manufacturing process is slightly different with all 3, which leads to some potential, subtle differences in clinical practice. Xeomin is a “naked injectable,” meaning that it does not contain any additives. A benefit of a pure-form injectable is that the human body is less likely to become resistant to it. Some patients have developed antibodies to Botox and Dysport. Xeomin is the only one of the three (Xeomin, Botox and Dysport) injectables that does not need to be refrigerated before use, due to its lack of additives. The cost of Xeomin is roughly the same as for Botox at $5.00-5.40 per unit. Dysport is about $3.99 per unit. Patients average 20 units of Xeomin per visit, vs. 20 units of Botox and 40 units of Dysport. The average retail cost to a patient in the US, for a Xeomin treatment, is between $300.00 – $400.00 every 3 months based on the recommended dose of 20 Units per treatment session. Neurotoxins diffuse differently, in part because Botox and Dysport have protective proteins clustered around the active part of the molecule, while Xeomin has no protective proteins. Botox has a full complement of protective proteins and weighs about 900 kD. Dysport is a mixture of 500 kD and 300 kD complexes of protective proteins and botulinum toxin A. Being heavier, these complexes migrate more slowly than Xeomin/NT-201, which is BTX-A without protective proteins. Conversely, you will have less precision. Dysport has been shown to “drift” or diffuse more than Botox, increasing the chances of an accidental droopy eyelid or unintentional relaxation of a neighboring muscle due to diffusion of the product. Botox and Dysport are not interchangeable because the products are dosed and injected differently. Please note: Botox, Allergan Botox Cosmetic and Juvederm are registered trademarks of Allergan, Inc. Dysport, Restylane and Perlane are registered trademarks of Galderma. Xeomin is a registered trademark of Merz Pharmaceuticals, LLC. This document contains discussion of agents that are not indicated by the U.S. Food and Drug Administration. The International Association for Physicians in Aesthetic Medicine (IAPAM), Allergan, Inc., and Medicis, Inc., do not recommend the use of any agent outside of the labeled indications. The opinions expressed in this document are those of the contributors and do not necessarily represent the views of the IAPAM, Allergan, Inc. or Medicis, Inc.. Please refer to the official prescribing information for each product for discussion of approved indications, contraindications, and warnings. The information presented in this document is not meant to serve as a guideline for patient management. Any procedures, medications, or other courses of diagnosis or treatment discussed or suggested in this activity should not be used without evaluation of their patients’ conditions and possible contraindications on dangers in use, review of any applicable manufacturer’s product information, and comparison with recommendations of other authorities. This publication is protected under the US Copyright Act of 1976 and all other applicable international, federal, state and local laws, and all rights are reserved, including resale rights: you are not allowed to give or sell this e-book to anyone else. No part of this e_report may be reproduced in any form by any means (including electronic, photocopying, recording, scanning, or otherwise) without prior written permission of the publisher. Please note that much of this publication is based on personal experience and anecdotal evidence. Although the author(s) and publisher have made every reasonable attempt to achieve complete accuracy of the content in this text, they assume no responsibility for errors or omissions. Also, you should use this information as you see fit, and at your own risk. Your particular situation may not be exactly suited to the examples illustrated here; in fact, it’s likely that they won’t be the same, and you should adjust your use of the information and recommendations accordingly. Any trademarks, service marks, product names or named features are assumed to be the property of their respective owners, and are used only for reference. There is no implied endorsement if we use one of these terms. Please note that the information presented on these pages is for informational purposes only. The IAPAM (or its affiliates), shall not be liable to anyone for any loss or injury caused in whole or in part by your use of this information, or for any decision you make or action you take in reliance on information you received from this text. This text is not intended to replace legal, medical, accounting or other professional advice, and is only meant to be used as a guideline for the reader. Any information in this publication should not be considered a substitute for consultation with a physician to address individual medical needs. © Copyright 2016, International Association for Physicians in Aesthetic Medicine. All rights reserved worldwide. Please do not use this material without referencing the IAPAM.